Until Operation Protective Edge, most of the “messaging” regarding the Israeli-Palestinian conflict, certainly that which broke through the mainstream media, came from the Israeli side. Since Zionism’s official beginnings in Palestine some 110 years ago, the Jewish community, whether the pre-state Yishuv or constituted as the state of Israel, never took the Palestinians seriously. They were dark-skinned “natives” wrapped sinisterly in kafiyas, fedayeen or terrorists without names, history or humanity, an existential threat subsumed under the rubric “Arabs.” In 1967, when Israel finally came face to face with an organized, visible, politically aware Palestinian society, the idea of talking to them did not even occur to Israel’s leaders. They preferred to take what land and resources they wanted from the West Bank and “return” its Palestinian population to Jordan. (No one until this day in Israel has the faintest idea what to do with Gaza, except isolate it.) One Prime Minister, Golda Meir, even denied vociferously and derisively that a “Palestinian” people even existed. No Israeli government ever acknowledged the national rights of the Palestinian people to self-determination in their own country, even in a tiny, truncated state on parts of the Occupied Territory. In the brightest days of the Oslo “peace process,” all a Labor/Meretz government agreed to do was recognize the PLO as a negotiating partner. It never accepted the idea of a truly sovereign, viable Palestinian state, even if demilitarized and arising on but a fifth of historic Palestine. The Palestinians’ messaging of peace, security and, yes, justice, was always buried under Israeli spin. At that very same Wye Plantation meeting, Sharon demonstrably refused to shake Arafat’s hand before the cameras. “Shake the hand of that dog?” he told reporters: “Never.” Mahmoud Abbas has gotten little better from Sharon or Netanyahu, despite repeated televised meetings with Israeli students, Knesset members or anyone else willing to listen to his pleas for peace, even at the price of giving up parts of East Jerusalem and some major settlement blocs. Abbas and his Palestinian Authority bear their share of the responsibility for this as well. For his own reasons Abbas has silenced his most articulate spokespeople, filled his Authority’s diplomatic posts for the most part with ineffective political hacks and makes it almost impossible for reporters to get information or responses – all in contrast to Israel’s vaunted hasbara and legions of professional spin-doctors. As a result, there has been little official Palestinian messaging at all. What has saved the day until now has been the efforts of civil society supporters of the Palestinian cause: the contributors to the Electronic Intifada, articulate Palestinian activists and academics on al Shabaka, events and actions initiated on campuses by Students for Justice in Palestine (SJP) and the myriad analysts, activists and organizations of the international civil society, including critical Israeli ones, not to forget the growing BDS movement. That seemed to change suddenly when, on August 26th, Israel announced that it had accepted a permanent cease-fire with no pre-conditions, to be followed by a month of negotiations over issues of concern to Gazans – opening borders, reconstruction under international supervision, the rebuilding of the airport and seaport, ending restrictions on Palestinian fishing and on farming in the “buffer zone,” the reopening of the “safe passage” to the West Bank, release of prisoners and more. Hamas, who led the confrontation with Israel, was careful not to disconnect Gaza from the wider struggle for Palestinian national rights. It was Abbas who announced the cease-fire, not Khaled Mashal or Ismail Haniya, stressing that the struggle was a Palestinian one, not merely Gazan. In fact, although Netanyahu initiated Operation Protective Edge with an eye to destroying a Palestinian Unity Government of Fatah/Hamas, he ended up strengthening it. Hamas emerged the darling of the Palestinian people, as least as far as resistance goes. 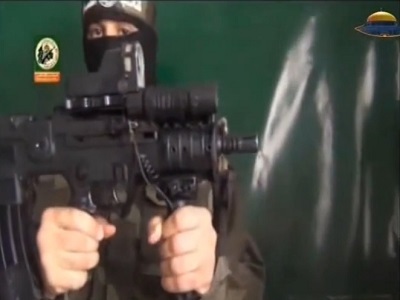 It was announced that Hamas and Islamic Jihad would be joining the PLO. And, in order to allow a kind of civil relationship with Egypt, Hamas lowered its pan-Islam Muslim Brotherhood profile in favor of its Palestinian one. Still, the messaging belonged to Hamas, the ones who not only confront the Israeli Occupation but who have seized the political initiative from it. In stark contrast to Abbas, who has declared security cooperation with Israel to be “sacred” and who passively allows Israel to take effective control of Area C, the 62% of the West Bank where the settlements, the massive matrix of Israeli highways and the Separation Barrier spell the end of the two-state solution, Hamas has sent a clear and forceful message to Israel: We won’t submit even if you kill us. Deal with us justly – or disappear. Yes, even in its moment of triumph – an Israeli commentator wryly noted on TV this week that “a Six Day War this will not be,” and polls show that 59% of Israelis do not believe Israel won – Hamas has left the door open to a two-state solution. Their position, as I understand it and as set out in the Prisoners’ National Conciliation Document of 2006, is nuanced but principled and coherent. Hamas and Jihad reject utterly the legitimacy of Israel, viewing it as a settler colonial state, and thus reject any negotiations with it or any subsequent recognition. That said, if other Palestinian parties (i.e. Fatah) enter into negotiations with Israel and the outcome is a total withdrawal from the Occupied Territory based on conditions that would allow a truly sovereign and viable Palestinian state to arise, and if such a outcome would be approved by a referendum of all Palestinians around the world, Hamas and Jihad would respect that as the voice of the Palestinian people. Thus, while still rejecting the legitimacy of Israel in principle, Hamas has agreed to join a Unity Government that accepts the two-state solution – enough for the Netanyahu government to try and break it apart. Hence Hamas’s post-Operation Protective Edge message to Israel: deal with us justly – or disappear. This is your last chance. The alternative to the two-state solution, which few Palestinians believe is still possible, and rightly so, is a single state. That’s a democratic state in the eyes of the Palestinian left, an Algeria-like situation in which the colonialists leave in the eyes of Hamas and Jihad. This should give Israel pause, although ironically it is Israel that has eliminated the two-state solution and has left a single state – an apartheid one in the eyes of all Israeli governments, including Labor – as the only other option. Indeed, just last month Netanyahu said publicly: “There cannot be a situation, under any agreement, in which we relinquish security control of the territory west of the River Jordan.” For 110 years “practical Zionism” has believed it can beat the natives, that it can judaize Palestine and, with its metaphorical and physical Iron Walls, cause “the Arabs” to despair of the Land of Israel ever becoming Palestine. Well, Israel has given it its best shot. After grabbing almost all the land, driving most of the Palestinians out, imprisoning and impoverishing them in tiny enclaves in both Israel and the Occupied Territory, after burying the Palestinian presence and patrimony under Israeli-only cities, towns, kibbutzim and national parks, after assassinating its leaders and leaving its youth with no hope of a future, it now brings the full force of one of the best-equipped militaries in the world against two million poor people living in an area the size of Mobile, Alabama. 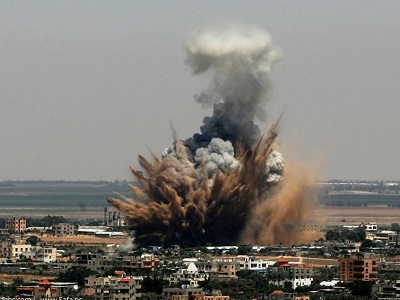 More than 2000 killed in Gaza, another 12,000 injured. Some 20,000 homes destroyed, 475,000 people displaced. Six billion dollars in damage to buildings and infrastructure. And for what? Israel may have finally discovered the limits of force and violence. After taking its best shots for more than a century – and, it is true, dealing the Palestinians devastating blows, as Netanyahu and the IDF proudly claim – Israel has gained one thing: an opportunity before it is too late to learn that the Palestinians cannot be beaten militarily, that Israel itself will never know security and normal life for all the “blows” it administers the Palestinians, as long as it maintains its Occupation. Indeed, for all its strength, it is liable to disappear if it doesn’t deal justly with the natives. At least Abbas seems to have gotten the message. He now discards further pointless negotiations with Israel as brokered by the US, preferring to have the UN set a target date for Israeli withdrawal, and perhaps going to the International Criminal Court. Hamas is likely to prevent any backsliding on his part. Maybe Israel will never get the message, its hubris blinding it to tectonic shifts in the geopolitical landscape, especially among the people of the world. But the collapse is happening. Perhaps slower than in apartheid South Africa, the Soviet Union, the Shah’s Iran or Mubarak’s Egypt, but happening none the less. Having lost the power of deterrence, Israel will either have to deal justly with the Palestinians or, indeed, disappear. Just having commented elsewhere using the word disappear, I read it here used in the same way. With all the time it has had, ‘Israel’ has long had its best shot. In all its manifestations without exception it has been an amazingly silly and inept shot; long undeniably so! This ‘Israel’ is a modern identity stolen from Judaism and now it embarrasses humanity. In order to save Judaism, ‘Israel’ has to go! Israel has to go, to disappear? Go where? Under the sea? Yesterday I heard Henry Siegman, on Democracy Now, say that perhaps the Palestinians should say, “Okay. You won. We’re not gonna have a state. Now we want to be full, equal citizens,” and protest (non-violently). The Israelis would have a hard time saying no, you can’t, and the international community even a harder time.